The kids (and their friends) have a strong tendency to take apart toys and spread the pieces all around the house, so that things with one specific purpose are separated from the other parts that would allow them to function. It drives me insane. When the most recent part went missing, I banned the Xbox until it is found, in the hopes that the boys (and their friends) would have incentive to look for it, and to try to remember where someone carried it off to in the first place. It's been three days and the part has not been found. Emmett: "But I'm banned from XBox!" Emmett: "Well then why am I banned from playing Minecraft?" Me: "Because you want to play Minecraft!" Emmett: "Well, uh, I want to play Raving Rabids!" Me: "Good - go play with Henry!" Henry asks, "Mom, how do you spell DVD?" I reply, "Dee Vee Dee." Henry says back, surprised and amazed, "There are two dees in DVD?!?" Emmett solved one side of a Rubik's cube today. He was really excited about it. Henry finally agreed to try swimming lessons, so I signed him up. As I was getting him ready for his first lesson, he started to get really worried and was saying that he changed his mind. I ran through all my pep-talk stuff but he was unconvinced. I finally told him that we'd just get ready for swimming and he could decide when we were at the pool, and that it was totally ok from me if he decided not to. That seemed to make him feel a little better. At the pool, he was still nervous and I tried a little pep talking again, this time emphasizing that it was his decision (and I meant it). He said, "Maybe I'll just put my feet in the water." So we started on the first step, with me explaining to his teacher what was up. After a couple minutes of coaxing, we got him to go down to the next step with the teacher. I realized that at this point, I was just a distraction, so I hurried off to sit along the side of the pool. He wasn't thrilled about putting his face in the water, but he never cried made any negative sounds during his lesson! 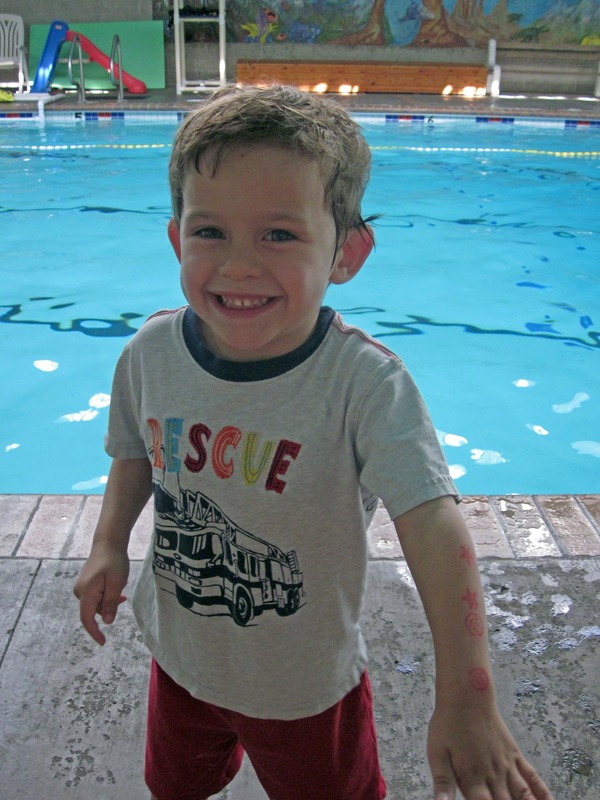 When he was done, he was so proud of himself and he earned both stamps - the smiley face for being happy in the water and the star for working hard. He's had about 5 lessons so far, and it's going great. He frequently says, "Why do I always have to have swimming lessons?!?" in an exasperated voice. But after his lesson, he's always beaming with pride and eager to go stamp up and down his arms. See?